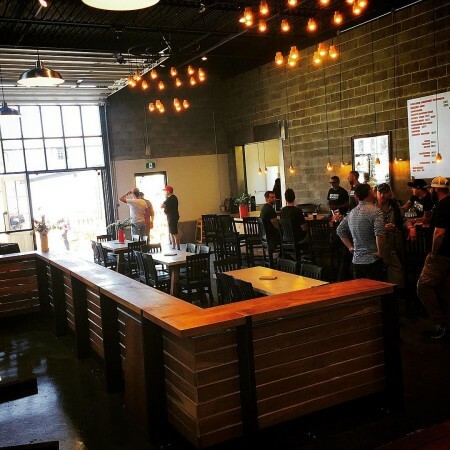 WELLINGTON, ON – Ontario Beverage Network reports that a new brewery has opened in Wellington, a small community on the shore of Lake Ontario in Prince Edward County. Midtown Brewing has been founded by British expat Paul Lees and Mark Andrewsky, and features a taproom, restaurant and retail store, as well as The Shop at Midtown, a store selling fresh produce and other items from local farms and producers. There will be Midtown Extra Special Bitter, Dry Irish Stout, a Kolsch, and Porter. We are going to do a 12-month aged Belgian Triple but instead of using candy sugars we will be using local honey and maple sugars. We’ll be doing a Barley Wine that will have 12 to 18 months aging on it. And we will also do seasonal stuff like nice light easy-drinking fresh Summer Ale. And I want to do something I call ‘Lumpy’ which is a very flat beer very much like with the original settlers in this region drank. It’s very much what the ploughman drank back in the day for his lunch. I think there is an interest for that kind of historical food and beverage and we can run it in limited batches. Midtown Brewing is located at 266 Main Street in Wellington. Operating hours will be 11:00 AM to 6:00 PM daily for the month of June, with longer hours to be announced later this summer.